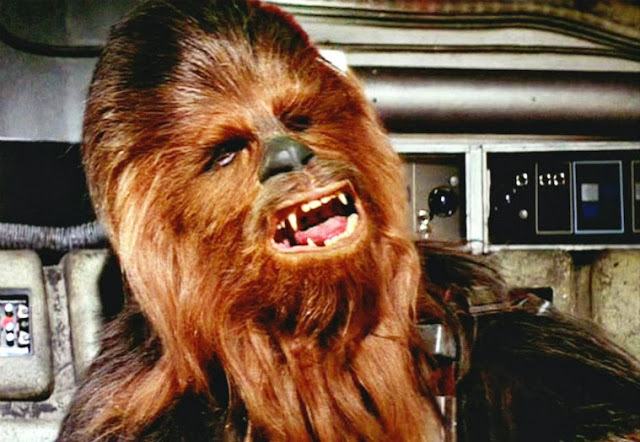 The 5 best Chewbacca quotes from the 4 Star Wars films he's ever Raarrwwrararrrrrrrrr ed in! While Chewbacca doesn't speak a line of English in the Star Wars films, he is an eminently quotable character. His growls, snarls, grunts and gutteral cries have conveyed a lot of meaning in the four films that he's appeared in. Often Han Solo has done the translation for the viewer but take the emotion delivered in the growl and the context of the scene and you'll see that Chewie is quite the nuanced character.. here's his most famous quotes from each of the four movies he has appeared in.